Products designed by Pharoah Editorial Inc.
We ceased manufacture of all Syncheck products during 2014. For 9 years our manufacture and distribution had grown continuously to become a very significant distraction, a byproduct of success. It was time to return to our roots. These informational pages are maintained for the benefit of our customers. Manuals for all products are available on the Downloads page. Warranties will be honored. Product support and ftp access to our test files will continue without change. If you require service or technical support of your Syncheck product, please contact us. FTP log in troubles? Please make a note of NEW FTP URLs, October 2012. Either of these should connect you to the server. Use your existing username and password to log in. 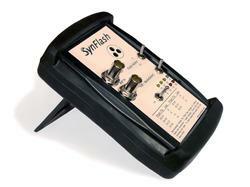 The most recent software v2 is recommended for all SynFlash users. See what is new with v2. Our products were designed and manufactured in the USA by Pharoah Editorial, Inc., a New York audio post production company. Syncheck, SyncheckII, Syncheck3, and SynFlash are and remain as trademarks of Pharoah Editorial, Inc.